After a tough first few days, it turned out the worst was yet to come for Aidan, my hiking companion – as if the physical exertion and affects of altitude weren’t enough, today was the day he inevitable came down with diarrhea, whereas yet again I was fine. I could tell he was beginning to get a little despondent, so I tried my best to cheer him up but I was beginning to fear it was no good. 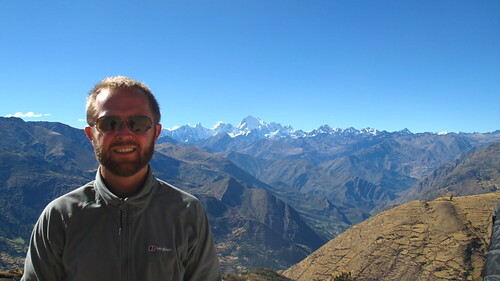 By the time we made it up to Punta Cuyoc (4950m), and some of the best views of the trip so far – in one direction to the Cordillera Riura to the south, in the other across to the highest peaks of the Huayhuash – he was starting to get too tired to even take it in properly. His state wasn’t helped by the fact that the other side of the pass saw our trickiest descent to date, heading down an exceptionally steep slope, on lose scree. By the time we got to the bottom he was beginning to talk of cutting his trip short. I think his mental state wasn’t helped by the fact that he knew what lay ahead – the toughest day of hiking of the whole trip. 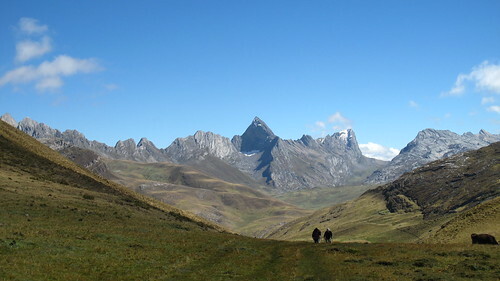 It got tough straight away – within five minutes of leaving camp we’d began the ascent towards the San Antonio pass. Starting out on steep, loose glacial moraine was hard enough, but the fact that the climb carried on relentlessly up the steepest and toughest terrain to date for three hours made it quite an effort. It wasn’t helped by the fact the distance we had to cover that day meant an early start, and the valley was cold and in shadow the entire time. There was one nice surprise on the way up – our early start meant we surprised a family of Vicuñas, who darted off across the mountainside as soon as they saw us. Eventually we made it to the top, at nearly 5100m the highest of the nine days, and looked out across the valley below to yet another beautiful lake, and across to the peaks of the highest mountains of the chain. As we started to head down, I was feeling great – I’d now been hiking above 4000m for twelve out of the last fourteen days, I was fully acclimatised and my legs were feeling fit, possibly fitter than I’ve ever been – and I practically bounded down the mountain. Inevitably enough, before I knew it the saying ‘pride comes before a fall’ came true literally, and within the space of five minutes I’d managed to fall over twice, in the process gaining two nice bloody cuts, one on each hand. Still, I didn’t let it knock my (over)confidence, which was probably the beginning of my downfall. 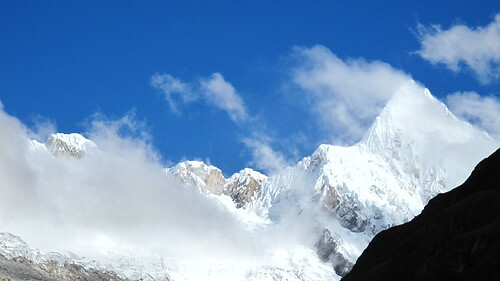 When we got to the bottom, the original plan had been to do a side trip up the next valley to see the basecamp from where Joe Simpson began his ill-fated ascent of Siula Grande (as told in his book Touching the Void). As we’d gone relatively slowly so far that day, to allow Aidan to keep up, we were running out of time. Furthermore, he really wasn’t in the mood for any additional unnecessary hiking that day, so he made it quite clear he was happy to skip that. Stupid me on the other hand, revelling in my newfound mountain legs, begged Nilton to let me give it a go, and he agreed, as I’d shown myself to be pretty quick so far. Big mistake. The hike there and back had been billed as four to five hours. We did it in an hour and forty minutes. If we’d walked any faster, we would have been running. On the plus side, I’d never have managed it a week before. I was to realise the negative side the following day. That night, even after sitting out the side trip, Aidan hit his lowest ebb, and was practically begging our guide to let him cut his trip short, after such an exhausting day (and his mental state was no doubt probably made all the worse by having to hike with a bouncy energetic me). In the end, they compromised on trying to find a horse to help ease the walking pressure, and by the knowledge that the worst was out of the way. My overconfidence in my own abilities really came back to bite me on the arse today. 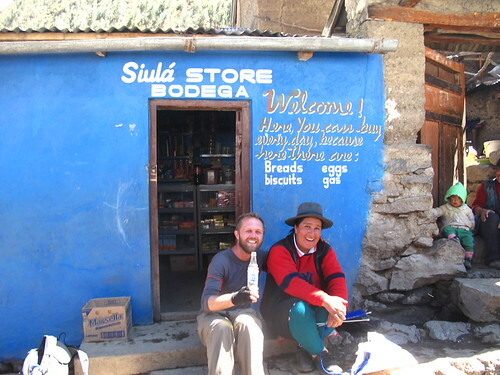 It started out easily enough, as we headed down a valley towards the one and only village we’d see in the whole trip, where we got the chance to stock up on Inka Kola and chocolate. But straight after that my problems began. Rather than being a short, steep climb, which quite suits me (I’m more of a hare than a tortoise), it was a looooooong, steady uphill. And suddenly, after the previous day’s exertions, all my energy deserted me, and my legs felt like lead. After being up to half an hour ahead of Aidan every day so far, I found myself struggling to even keep up with him. Each step was a nightmare and I realised I’d really pushed myself too hard the previous day. By the time I got to the top, I was ready to collapse. On the bright side, I think my struggles put an extra spring in Aidan’s step, and he was helped by the fact that his fitness and especially his acclimatisation had finally caught up with mine, and that he was also feeling fully well again. I think the fact that the final campsite was the highest yet – at nearly 4700m it was almost right at the top of the Tapush Punta pass – was what caused me to have my only bad night’s sleep of the whole trip, and I woke at the stupidly early hour of 5am to get an early start for the long trek back to catch my bus back to Huaraz, feeling rather tired and slightly grumpy. Luckily though, my legs were feeling back to normal, probably helped by the fact my mind knew I was only a matter of hours away from civilisation, and I set off on the longest day’s hiking yet. The problem was that thanks to an agency mix-up, I was booked on for nine days but the others twelve – meaning I’d essentially only done about three quarters of the circuit and still had two days worth of hiking to cover off on my final morning. With an 11:30am bus to catch, for the first time I was hiking with a deadline, meaning there was no messing around. Having left my guide Nilton with Aidan, who still had another three days left, I was left in the hands of a fifteen year old local boy who was helping out to make a bit of money. He may have been fifteen, but I was no match for his pace – we bounded down the valley at a ridiculous speed, leaving me panting in the attempt to catch up. Matters took a slightly farcical turn as we forded the river – part of the crossing had been washed away, meaning I had to leap across the rocks. This turned out to be an unwise move. I had a small rip in the crotch of my trousers from earlier in the trek. As I leapt in the air, the loud tearing noise I heard told me that rip had got a whole lot worse – and it had – it had ripped right open, leaving a huge chunk of fabric flapping around and providing very little cover of underneath. With no spare pair of trousers I had no choice but to complete the trek with my fleece tied round my waste, using the dangling arms to cover the gap. The final section continued at the same relentless pace – climbing up a slope to a long, flat path (on top of an aqueduct) that clang to the side of the valley all the way round to our final destination, the village of Llamac. With time rapidly running out, the pace increased even further, to the stage where even my local guide was getting exhausted. One final descent (mostly tackled in a run) later and we back in the village. I just had time for a nice cold beer (oh, and to unwittingly flash at a horrified-looking indigenous woman after my fleece fell off revealing the torn trousers underneath. Whoops) before it was time for the bus back to Huaraz. So did it live up to the hype? You bet. It was the physically most challenging thing I’ve ever done, but because of that, one of the most rewarding. I saw the most beautiful landscapes I’ve ever seen, and even better most of the time I had them all to myself, with not another person in sight. The tranquility was absolute, and I had time to fully take in the beauty, and plenty of time to think and reflect on life, my trip, and on my life back home. I’ve never been able to fully appreciate silence before (I’m far too energetic for that), but it felt like I really learnt how to relax and enjoy the calm properly for the first time in my life. Even listening to music on my iPod (until the battery died) was a magical experience – sitting there on my own on a high mountain pass waiting for the others, taking in the view with my favourite music in the world as a soundtrack, was almost enough to bring tears to my eyes. Best hike in the world? Who knows. But it’s certainly the best thing I’ve ever done. You can see all my photos here. 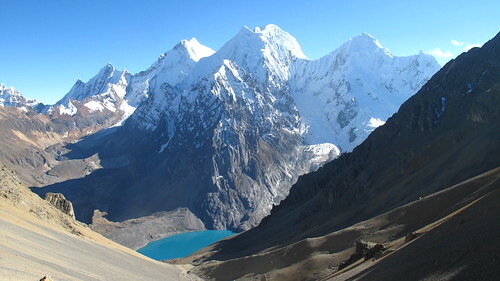 Besthike.com describes the Huayhuash circuit as ‘arguably the best hike in the world’. Other sources I’ve seen reckon it’s the second best after the Annapurna Circuit in Nepal. Reports like that meant that hiking there was the single thing I was most looking forward to in my entire year of travelling. I knew it’d be hard work, but as a keen hiker it doesn’t get much better than this. 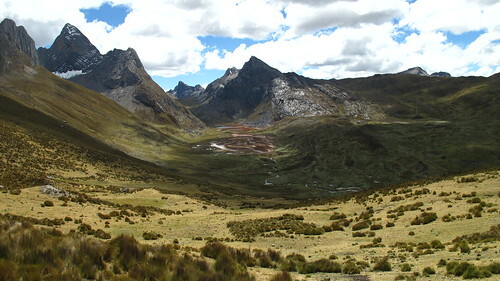 The Cordillera Huayhuash (pronounced ‘why wash’ – rather apt seeing as the prospect of washing in the freezing glacial streams along the way was none too enticing) sits just a few hours south of Huaraz and the Cordillera Blanca, and is the second highest section of the Peruvian Andes after its northern neighbour. It may not be quite as high, but it’s more remote, rather wilder, and gets far fewer tourists. It’s probably best known to the rest of the world as the location for the events that inspired the book and film ‘Touching the Void’, the story of an accident that befell two British people climbing the treacherous mountains of the region. The circuit itself takes anywhere between eight and fourteen days, and there are a number of different routes. All of them complete a full circuit of the Cordillera, spending almost the entire team at an altitude of 4000m plus, with most crossing over high mountain passes (over 4500m) every day, and the shorter routes sometimes managing two in one day. This makes it a fair bit tougher than the Santa Cruz trek, and it was that challenge that got me really excited. 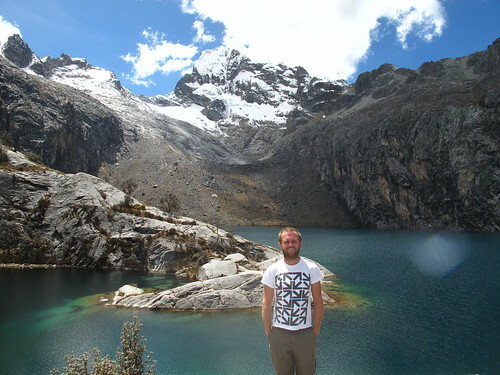 I realised it was going to be a rather different experience to the Santa Cruz trek as soon as I got in the car in Huaraz – originally I was booked to go in a group of five, but three had pulled out due to illness, meaning it was just me and a guy from Ireland. I’m not one for overly indulging in national stereotypes – but boy did he live up to the popular image of a jolly Irishman. Especially with one regard – I’ve never met someone with the gift of the gab quite like that. He talked non stop all the way to the trailhead, with pretty much any thought he had coming straight out of his mouth. Most of the time it was pretty entertaining, but I was worried that with just him and the guide (who didn;t speak much English) there was a risk it’d get pretty tiring quite soon. After the long drive (four hours through the foothills of the Cordillera), the first day’s hike was short and pretty easy, gently heading away from civilisation up a winding valley. It didn’t take long after arriving for me to realise the other big difference we were going to face – being a little bit further south, a bit higher in altitude and a bit more exposed (as the valleys are wider), the nighttime temperature made the Santa Cruz nights seem almost balmy in comparison. Although at least I was finally able to make good use of all those thermal layers I’d been carrying around at the cost of a fair bit of weight for the last four and a bit months. After a warming breakfast of oats we were soon on our way, and with no messing about we were straight into the climb up to the first pass, the 4690m Cacananpunta. As if to show us that the Huayhuash circuit is no laughing matter, this was longer, steeper and tougher than any of the previous climbs I’d done, and by the time I reached the top, I was exhausted. Still, I was grateful of the preparation I’d had on the previous hikes, as my trekking partner found it even tougher, taking an extra half hour to make it to the top, a pattern that would be repeated for the rest of the hike – although at this stage I didn’t realise quite how tough he was finding it. 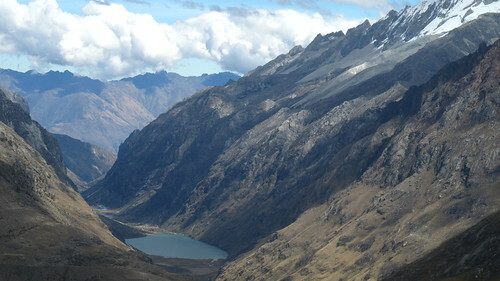 The rest of the day was spent descending back into a broad valley, to our campsite at lake Mitacocha. At this point I realised I needn’t have worried that this trek would just be repeating similar scenery to the Santa Cruz trek – in the Cordillera Blanca, the valleys are narrow and steep-sided; here in the Huayhuash they are much broader, giving wonderful sweeping vistas across the landscape. My main worry was still my knee – yet again, despite the help of my poles, the twinge of pain was beginning to return on the way down – I prayed it wouldn’t get any worse or nine days would be torture. The third day was rather easier, for me anyway – but quite a different matter for my Irish companion. The day’s pass, Punta Carhuac, was nearly as high as the previous day’s, at 4640m, but the approach was far more gradual, which was fine for me. Unfortunately, it turned out that Aidan had been badly advised when booking the trek from back in Ireland, and he’d only had one day to acclimatise – and he was really feeling it. I felt really sorry for him struggling on his way up – with a further nine days to go for him (he was booked on for a twelve day trek, rather than my nine), we were both hoping he’d catch up in the acclimatisation stakes and be OK for the days to come. 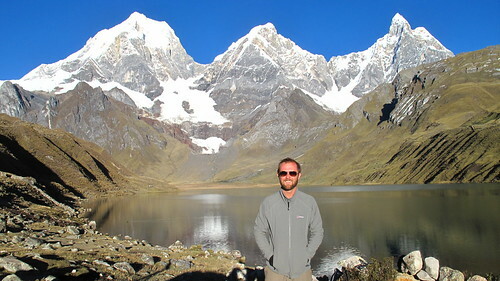 Highlight of this day came right at the end, as we headed down a valley towards the gorgeous turquoise lake Carhuacoccha, beautifully framed by the peaks of three snowcapped mountains sitting behind, at the opposite end of the lake from our campsite. If I’d thought Carhuacoccha was beautiful when we approached the afternoon before, nothing could have prepared me for the sight I was to see on waking up the next morning. 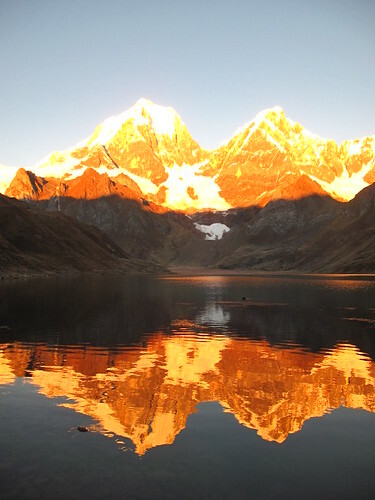 The rising sun behind us bathed the mountains in a bright golden light, the mountains shining like they were on fire, and with the three burning peaks reflected perfectly in the still, clear water of the lake in front. It was the most beautiful thing I’ve ever seen, and all the campers round the lake stood there in silence, in awe of nature at its most powerful. The rest of the day couldn’t quite match a start like that, although it did its best, throwing at us some local wildlife (the rabbit-like vizcachas, hopping around at the bottom of the valley), and then a series of ever bigger mountains, each setting off a series of little (but very noisy) avalanches as the rising sun hit them. Sitting at the bottom of the mountain was another series of lakes, one dark blue, one bright turquoise, and one frozen. The saddest thing to see was the lines of glacial moraine clearly showing quite how much the glaciars here have retreated, a pattern I was to see regularly over the next few days, and Nilton, our guide pointed out quite how much of that retreat had been in the last couple of decades. Never before have I seen the effects of global warming quite so clearly spelt out in the landscape. 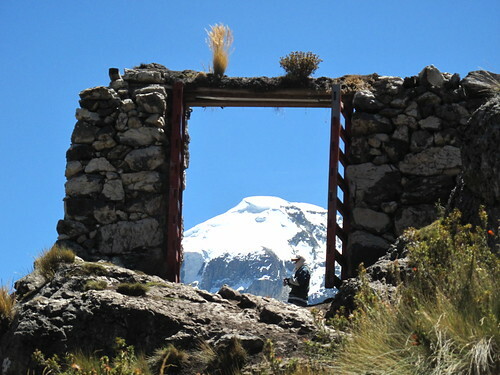 The day’s climb was yet another toughie, taking us up to the 4834m Siula Punta, with breathtaking views all along the way. I don’t want to sound like I’m getting blasé about stunning views, but the next day brought nothing particularly worth noting other than continuing awesome mountain vistas, as we headed past yet another huge lake up to the 4785m Punta Portachuelo. Instead, the highlight was of a different nature, as the campsite at Viconga (4453m) had natural hit springs. After five days of hiking and the closest to a wash being a good rubdown with baby wipes, the chance to spend a couple of hours getting clean, warming up, and soaking tired limbs in the almost scaldingly hot waters was bliss. I could have lain there all night. You can also subscribe to get updates by RSS or email by clicking one of the links top right. 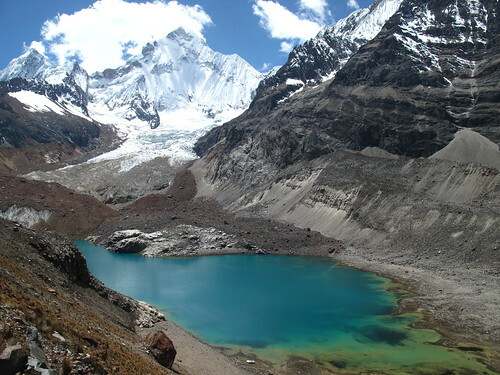 The Santa Cruz trek is the best known and most popular trek in the Cordillera Blanca, and for good reason. 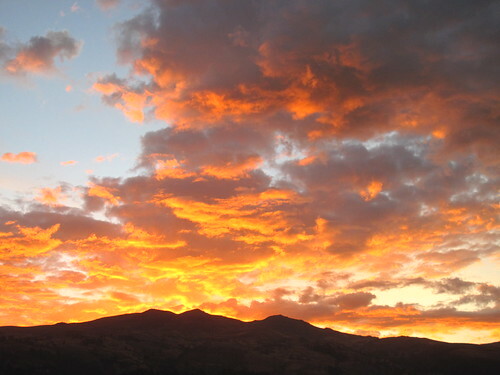 Over the course of four days, it loops around the highest part of the range, mostly staying beautiful alpine valleys, and giving stunning views of the range’s tallest and most beautiful mountains, as well as a series of spectacular lakes. After successfully tackling a number of hikes so far on my trip (such as Volcan Santa Maria in Guatemala and the Lost City trek in Colombia), I had been pretty confident the Santa Cruz was well within my abilities. Having completed the rather grueling Laguna Churup day hike, I suddenly wasn’t so sure. 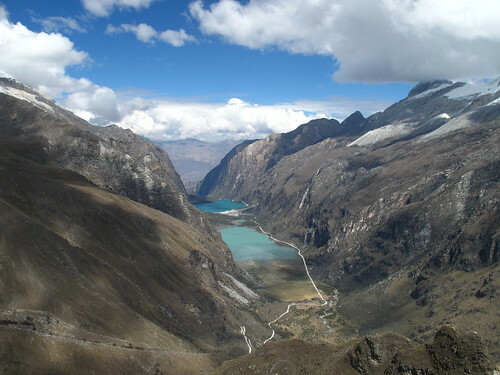 I had planned to do a second acclimatisation hike to Laguna 69 on my third day in Huaraz. Waking up that morning my legs were pretty stiff and my knee was still aching slightly. I decided I’d be better off with a rest day and prayed that everything would be OK for the saturday morning, although I decided to leave nothing to chance and spent an extra $12 hiring some good trekking poles, ideal for taking the weight of the knees on steep descents. I was relieved to wake up early on the first day with the stiffness in my legs gone, and feeling pretty used to the thin air, both of which had me feeling more confident about the day ahead. Even better was stopping for breakfast on the way to the trailhead, as it gave me a chance to get to know the group a bit better – I’d be hiking with four couples (two fellow Brits, two Swiss, one British-Australian and one German-Peruvian), as well as a solo Brazilian guy. Quite a mix of nationalities and languages, but it soon became clear we all clicked really well and they’d be a great group to walk with. The journey to the start of the hike was stunning enough in itself – as the bus climbed up from the village of Yungay (scene of the Western Hemisphere’s worst ever national disaster, the 1970s earthquake that buried the entire town killing all but a handful of the inhabitants) up into the valley, we were soon rewarded with a view of a beautiful turquoise-coloured lake, with Huascaran, the world’s highest tropical mountain towering above us. After that, the road climbed up a series of steep switchbacks towards a high mountain pass to take us over to the eastern side of the range where we’d start the hike. We’d already been warned the first day was going to be the easiest of the lot, consisting of a pretty short, flat hike along the bottom of the valley. It was a nice gentle introduction to the walk, and all along the way we’d regularly be stopped by sweet local children begging us for our ‘caramelos’ (sweets). It was impossibel not to oblige. The biggest challenge on day one was getting used to the cold once night fell – at this latitude, the mountains are incredibly warm during the daytime (and the sun fiercly intense) – but with clear skies at night the temperature soon plummets and I needed every layer I had just to stay warm. Day two was the hard one – and after Laguna Churup I worried how I’d cope, given we’d be climbing to 4750m, three hundred metres higher than I’d done a few days before. Luckily, my worst fears weren’t realised. It was pretty hard work, struggling up the steep slope, stopping for breath every few minutes, but I was determined to get there, helped along the way by the knowledge it would be a chance to stop for lunch, and then afterwards it’d be downhill all the way to the end of the trip. In the end, there was nothing as steep or as difficult as the final ascent at Laguna Churup, and I reached the top ahead of the rest of the group, giving my time to enjoy the amazing views all to myself. The pass itself, called Punta Union, is a little notch in a high ridge dividing the two valleys, meaning you can’t see anything at all of what’s on the other side til you reach the final step. The second valley, Santa Cruz itself, is if anything even more beautiful than the valley we’d just left, looking down across yet more snow-covered peaks and towards another couple of bright blue lakes. 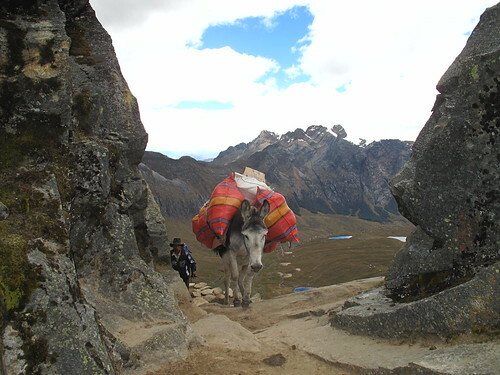 After a slog like that, you really appreciate having donkeys to do all the hard carrying work (it’s quite an amazing sight watching them wind their way up the steep slopes with far more ease, and speed, than humans), as well as a chef to make nice filling meals on our return to camp – I can see the appeal of doing treks like this yourself, but the last thing I’d want to do is have to cook dinner once I’d finished walking for the day. which came as quite a relief – I certainly wouldn’t have fancied three days of walking steadily downhill in constant pain. The second night brought a little disappointment for all of us and quite a bit of discomfort for most. The disappointment was that Alpamayo, called the world’s most beautiful mountain (for its almost perfect pyramid shape) was shrouded in cloud. The discomfort was the fact that most of the group had fallen ill to diarrhea – whether it was brought on by dirty water or dodgy food we don’t know, but I didn’t envy the few who were up all night and then having to hike on the next day with depleted energy reserves. Yet again my iron constitution saw me through though, and I felt fit as a fiddle. The disappointment continued the next morning, as Alpamayo sat stubbornly refusing to come out of the clouds properly. 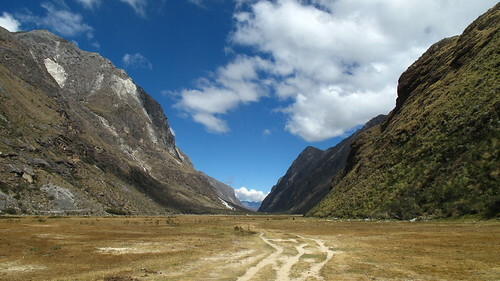 We got a brief, partial glimpse, but not enough to see it in its true majesty (although apparently we didn´’t miss all that much – it turns out it’s the world’s best when viewed from the other side anyway – you have to do the longer and tougher Alpamayo circuit to see that face). Still, the rest of the mountains did their bit to make up for it, and with their snow-capped peaks gleaming under the bright blue sky we certainly had nothing to grumble about. The final couple of days follow the Santa Cruz valley back to civilisation, and it really is an awesome sight – the glacial valley has towering, steep-sided walls, with glacial waterfalls cascading down the sides at regular intervals, running into little streams that wind their way across the flat valley floor, and feeding the lakes we’d seen from the pass above. Eventually we made it back, with tired legs but smiles on our faces, glad to be heading back to showers, beer and pizza. 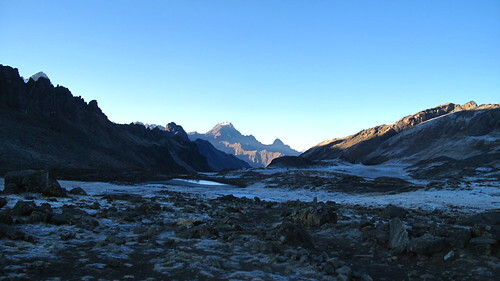 Turns out that my ‘acclimatisation’ hike to Laguna Churup had been more challenging than the Santa Cruz turned out to be, and I was extremely relieved that my knee had just about made it through without too much bother. The hike gave me the best mountain views I’ve ever seen – it truly deserves the term breathtaking, and I have to say it was the highlight of my trip to date. The only thing that was worrying me was how on earth the Huayhuash circuit could live up to it (oh, was well as hoping that just the one rest day in between would be enough time for my legs to recover). 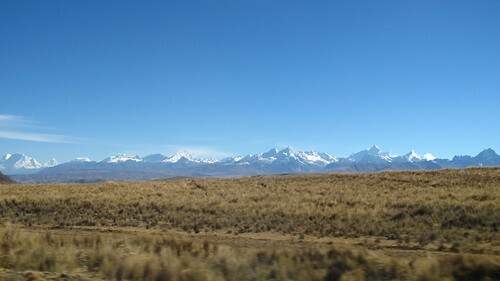 Arriving in Huaraz was just what I needed after six weeks in Colombia. I mean, I wouldn´t say I partied non-stop there, but it´d be fair to say it was my most sociable country so far. What I need was a bit of time up in the mountains to get away from it all, and the Cordillera Blanca seemed like the perfect place. 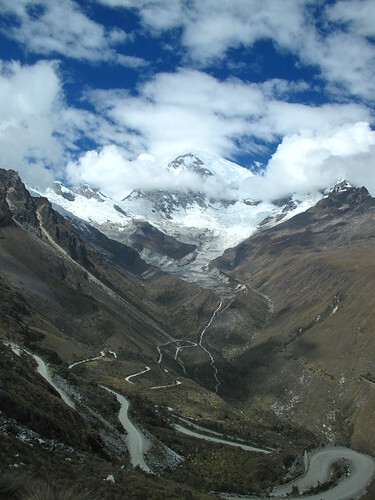 With the biggest cluster of 6000m+ peaks outside of the Himalayas, the Cordillera Blanca is the world´s highest tropical mountain range. Besthike.com claims the area offers the best Alpine hiking in the world, and that was enough to make me plan my trip around them – I wanted to make sure I was there at the height of the Andean summer, to make sure I made the best of the weather. That was certainly the right decision – I stepped off the nightbus from Lima to find myself in a town ringed by some of the most beautiful mountains I´d ever seen, all lit up by bright sunshine and framed by a deep blue, cloudless sky, which was a godsend after the constant grey skies that hang over the capital at this time of year. 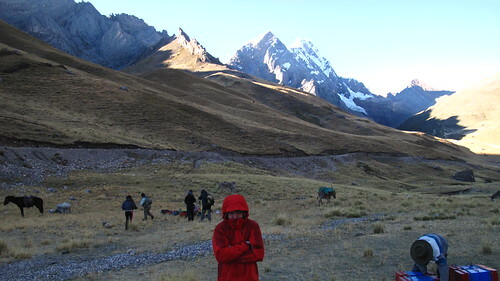 I was in Huaraz to do two multi-day hikes, the Santa Cruz trek & the Huayhuash circuit (trip reports on both of those coming soon), but the first step was to get acclimatised. 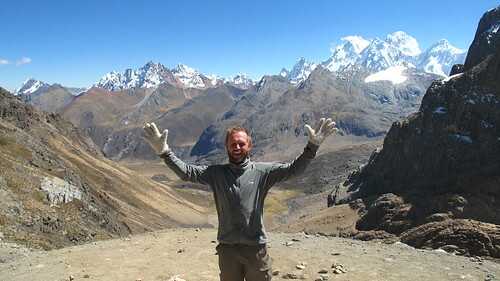 Other than day hikes in Guatemala and Colombia to over 3500m, I´d never spent a significant amount of time at altitude before, so I made sure I built in a conservative amount of time to acclimatise before heading onto higher and more strenuous stuff. Day one was spent chilling out and adjusting to the thin air of Huaraz, much of it spent enjoying the fantastic coffee at Cafe Andino. As I felt no ill effects, I was up bright and early on my second day to try my first spot of walking, on a day hike to Laguna Churup, which I´d been told was ideal preparation. After a short collectivo ride to the trailhead, the walk started gently enough, winding its way gradually uphilll through farmland with lovely views of the Cordillera all around. 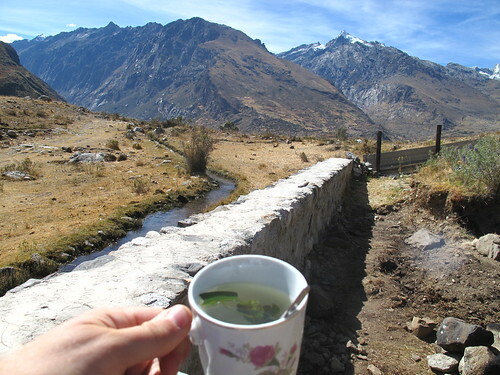 After an hour or so I reached a little farmhouse where I was able to stop for a warming cup of coca tea (also handy for the effects of altitude) before starting on the serious ascent. And boy was it a serious ascent. It was probably a combination of being unprepared for hiking that high up, plus a certain amount of unfitness, but every step was a bit of a struggle – I was constantly short of breath and going any distance at all was quite an effort, and I suddenly started to worry about what I was letting myself in for, with two multi-day hikes to come. The worst was yet to come, too. The final hundred metres or so consist of a steep scramble up the side of a waterfall. It was pretty tricky, and very tiring, but it was all worthwhile as I rounded the top and the view of the laguna opened up in front of me. Too tired to do much exploring, I plonked myself down on a rock to take in the views and enjoy a spot of lunch (made even better by an Israeli hiker who happened to have a little stove and was preparing fresh coffee just as I arrived…if only that always happened) and chilled out for an hour or so. Eventually it started to get a tad chilly, so it was time to head back. 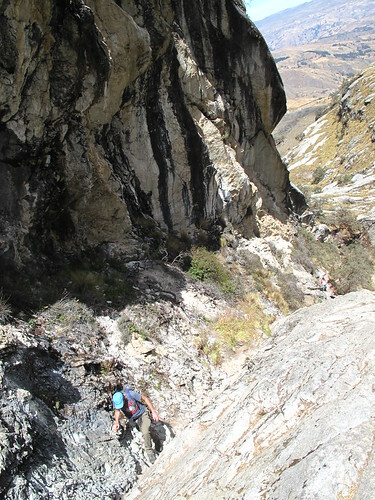 If anything, the descent was even tougher, with the scramble down the waterfall being especially tricky. After that I thought I´d be fine – until the thing I´d dreaded happened: my knee started to hurt. I injured it running about five years ago, and despite physio it´s never been quite the same since, but it´s been OK enough for walking up til now. On this particular day, it started to throb as soon as the downhill section started, and the pain got worse and worse on the way down. By the time I got to the bottom I was hobbling along with avery pronounced limp. Not a good sign at all. I thought I was going to get a gentle acclimatisation hike – instead I ended up with the toughest day hike I´ve ever done. Worse, with my knee playing up, suddenly my plan to spend three weeks in the mountains, the single thing I´d been looking forward to most in my entire trip, was under threat. 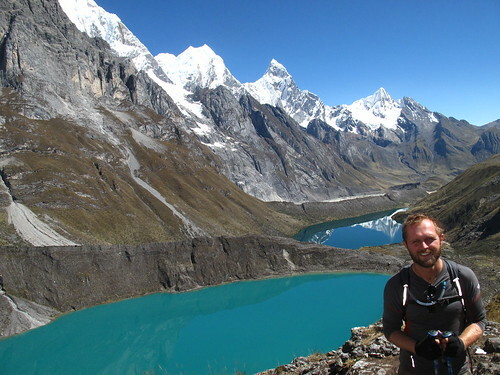 I’m going to be spending most of the next two weeks doing multi-day hikes in the Cordillera Blanca & Cordillera Huayhuash around Huaraz in Peru, so apologies in advance for the lack of updates. 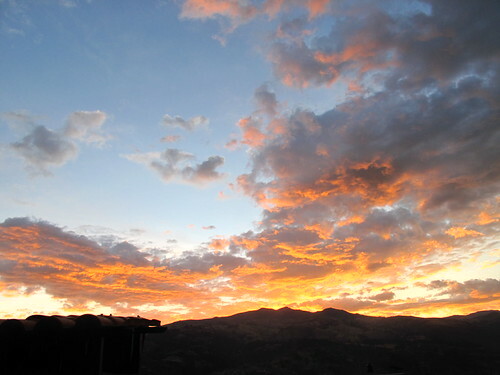 In the meantime, here’s a picture of last night’s sunset over Huaraz. This place is stunning, the area is possibly the most beautiful I’ve ever been to. See you all when I’m recovered from the hiking.